Image of the Elliptical-ring pin-fed patch. 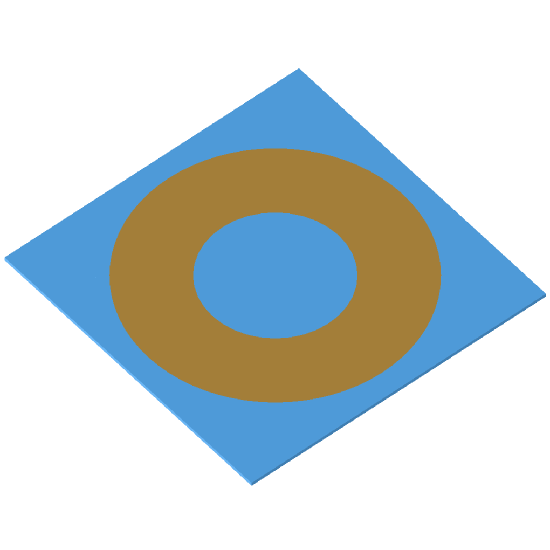 Microstrip antennas, also called patch antennas, are very popular antennas in the microwave frequency range because of their simplicity and compatibility with circuit board technology. It is usually operated near resonance to obtain a real-valued input impedance. The elliptical ring patch antenna is smaller than its solid circular and rectangular counterparts when it is operated at its fundamental TM11 mode. When operated at the TM12 the elliptical ring antenna exhibit wider bandwidths than its solid circular and rectangular counterparts, but at the expense of size.